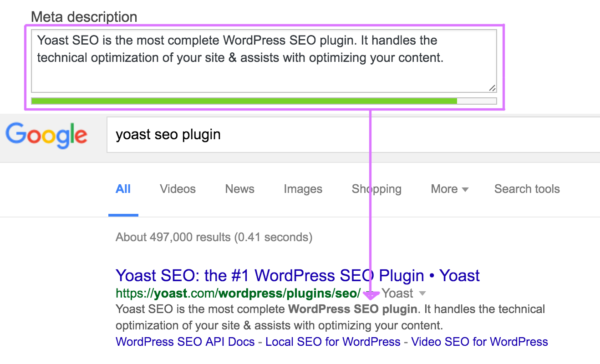 The Content & SEO Analysis Tool in the Yoast SEO plugin measures many aspects of the text you’re writing. These checks run real time, so you’ll receive feedback while writing! The content analysis helps you to make your text easy to read, while the SEO analysis checks whether your text is SEO-friendly. In this post, I’ll first describe the most important features of the Content & SEO Analysis Tool. After that, I’ll explain how to use and interpret these features. Warning upfront: content before SEO! If you write a readable text (based on the aspects mentioned above) the plugin will indicate this with a green bullet. The second tab of the content & SEO analysis is the SEO tab. In the SEO tab you’ll find the snippet editor, the field to enter your focus keyword and the SEO checks. 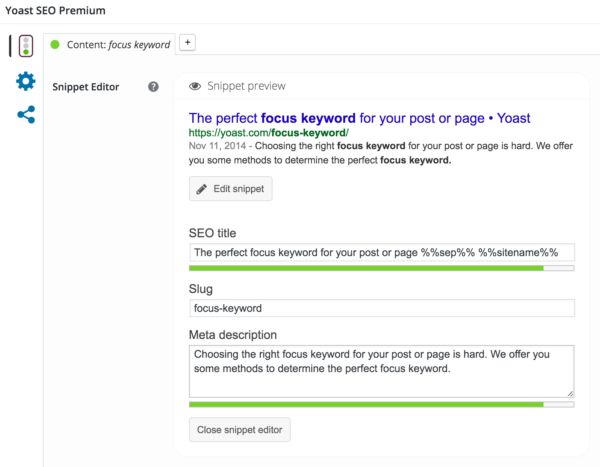 The snippet editor allows you to formulate a meta description. This description has to be a short text describing the main topic of the page. If the meta description contains the search term people use, the exact text will be shown by Google below your URL in the search results. the alt tag of the images. The plugin also checks the presence of links and images in the article. It calculates the number of words and the density of usage of the focus keyword in the article. Moreover, the plugin checks whether you’re using the same focus keyword on other pages of your website. This should prevent you from competing with yourself. If you write a relatively SEO-friendly text (based on the aspects mentioned above) the plugin will indicate this with a green bullet. Writing pages that are rewarded with green bullets will help you improve the ranking of those pages. In the content & SEO analysis content comes before SEO. That means that first and foremost, you have to write an awesome article. You should put an effort into writing an attractive, structured and readable text. Use our content checks in order to make sure your text is nice and easy to read. Once you finished optimizing your text for readability, you can look at the checks in the SEO analysis tab. If you’ve done your keyword research properly and you’ve written your post or your article with a focus keyword in mind, don’t go change your focus keyword now! Read The temptation of the green bullet for more in-depth information about that. You’ve written your article or your blog post. You can write directly in the backend of WordPress or write in any kind of text editor and copy your text into the WordPress backend. Do whatever you like! If you choose to copy your text in the WordPress backend, copy without the layout. You should adapt the layout in the backend, otherwise you might run into some layout problems. Make sure to set subheadings into heading 2, sub-subheadings to heading 3 and so on. Then put the title of your post in the title box. 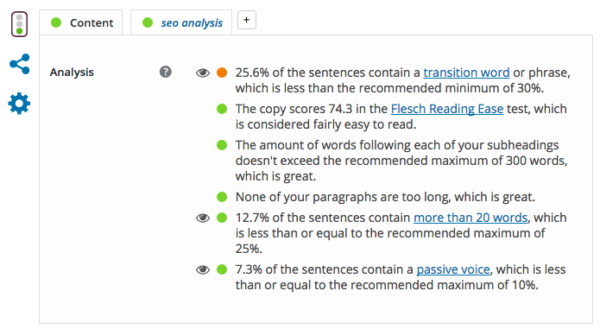 Clicking on the content analysis tab will allow you to see your scores on the readability checks. The green bullets show which aspects are good. Orange and red bullets indicate where you can improve your readability. Clicking on the little eye will highlight sentences in which the analysis encountered a problem. The content checks will help you to make your article easy to read. 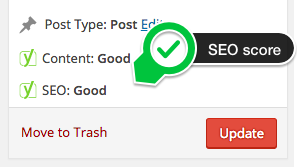 Make sure that the overall bullet (the one on the upper right in the backend of your post) is green. The overall bullet will become green if the majority of the readability aspects are covered. The checks of the content analysis will show you what aspects of readability need improvement. Some of the readability issues are easy to fix. If you tend to write long sentences, our content analysis will show you which sentences you have to rewrite. You should divide long sentences into multiple shorter sentences. If your paragraphs are too lengthy, you should divide them into smaller bits. If you use passive voice too often, try to rephrase some of these sentences. Add extra subheadings if your subheading distribution isn’t optimal. If your text scores red bullets on transition words or on Flesch Reading Ease, it will be harder to make improvements. Your Flesch Reading Ease score will benefit from shorter sentences. Check whether you use many difficult words (containing more than 3 syllables). Could you perhaps rewrite these? A text low on transition words can be improved by adding some transition words. You cannot add these words randomly, though. Analyze the structure of your text and decide which transition words are appropriate. Which words would make the relation between paragraphs and between sentences more clear to your readers. Does the text perhaps contain an enumeration in your text? In that case, you could add transition words like firstly, secondly and finally. And maybe you could add transition words in your conclusion as well. Do words like summarizing, thus or therefore fit in your concluding paragraph? After you finished optimizing the readability of your article, you should start the SEO analysis. Click on the SEO tab and enter your focus keyword in the appropriate field of the Yoast SEO Metabox. 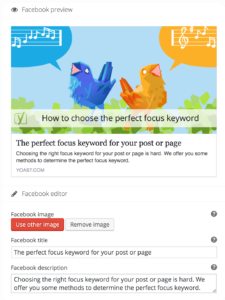 Your focus keyword is the keyword you would like your post to rank for. Ideally, this should be a keyword which emerged from your keyword research and which you have kept in mind during the entire writing process. 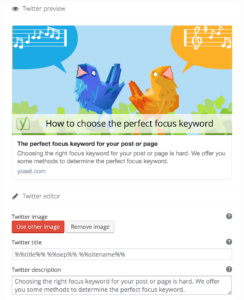 Yoast SEO premium offers the possibility to optimize one article for more than one focus keyword. Optimizing your post for multiple keywords allows you to rank for more keywords and to gain traffic to your site through more keywords. Enter the meta description of your post. Describe clearly what your post or article is about. And make sure you use the exact phrase of your focus keyword. The meta description will be shown by Google below the URL if people search for your focus keyword. It’s important that the meta description contains the focus keyword. Not because it will improve your rankings, but because otherwise Google usually won’t show your meta description in the search results. Google will try to match the search query with the description. If the focus keyword isn’t mentioned in the meta description, Google will just grab a random piece of content from your page containing the keyword. The meta description shouldn’t be too long. On the other hand, there’s no ‘penalty’ for having too long meta descriptions either. What you should pay attention to is: 1. the logical bits of it are of the right length and, 2. when it’s cut in half, it still makes sense and still entices people to click. Check out those SEO bullets! The green bullets again show you which aspects of your SEO are good. Orange and red bullets indicate where you can improve your SEO strategy. You don’t have to keep on optimizing until all of the bullets are green. Posts on Yoast.com, often have a few orange bullets and sometimes even one or two red bullets. The important thing is that the overall bullet (the one on the upper right in the backend of your post) should be green. The overall bullet will become green if the majority of your SEO aspects are covered. The checks of the SEO analysis will indicate on what aspects you could improve your SEO. Make sure to look critically at your title, the headings and subheadings of your article. Do these contain your focus keyword? If not, can you alter them (without changing the structure or content of your article) in such a way that they will contain your focus keyword? Don’t put your focus keyword in all of your headings though! That is too much. Using your focus keyword in one heading and in your title should be enough. You can read more about headings in one of Michiel’s posts. You should also mention the focus keyword in your text a couple of times. If you didn’t mention your focus keyword in the first paragraph, alter that. Throughout the text, you should mention it again. As a general rule of thumb: try to use your search terms in about 1 to 2 percent of your text. Say your article has 300 words, that means you should mention your search terms 3 to 6 times. 300 words isn’t the exact goal, nor is the amount of keyword mentions. However, 300 is a decent minimum for the number of words of an article that needs to show authority. The final step to take in the Yoast SEO meta box is filling the Social data. If you fill out a description or title for a social network on this tab, it’s shown in the metadata for the page. This means this description, title or image will be shown when the page is shared on the respective social network. These descriptions basically have the same requirement as the meta description (which is what they fall back to), but usually, can be longer. They should tell people what to expect and why they should click. The preview screenshots on the left are taken from Yoast SEO Premium, in free, you won’t see those previews, just the fields! SEO copywriting remains hard. Make sure to read SEO copywriting: the Ultimate Guide for more practical tips. The content & SEO analysis of Yoast SEO makes the process of writing awesome and SEO-friendly articles much easier. We are currently working on more checks to add to our content analysis. So stay tuned!